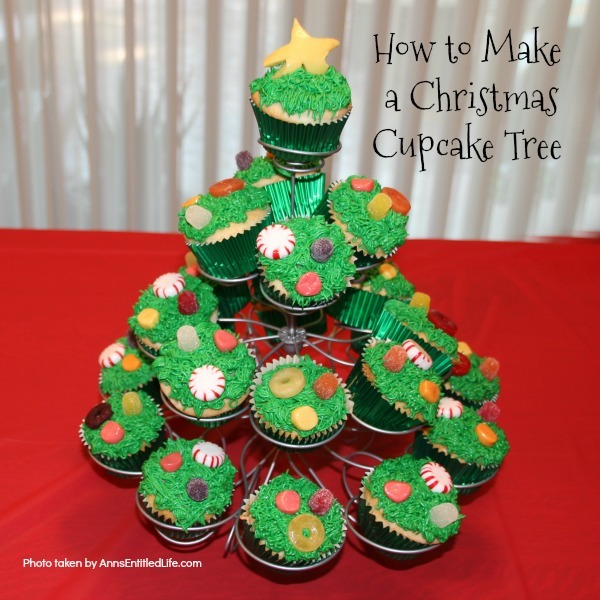 This simple step by step tutorial will help you put together this wonderful Christmas cupcake display. Great as a holiday party dessert display, for a centerpiece at the children’s table, or for a Christmas buffet, this Christmas cupcake display is easy to put together and oh so cute! 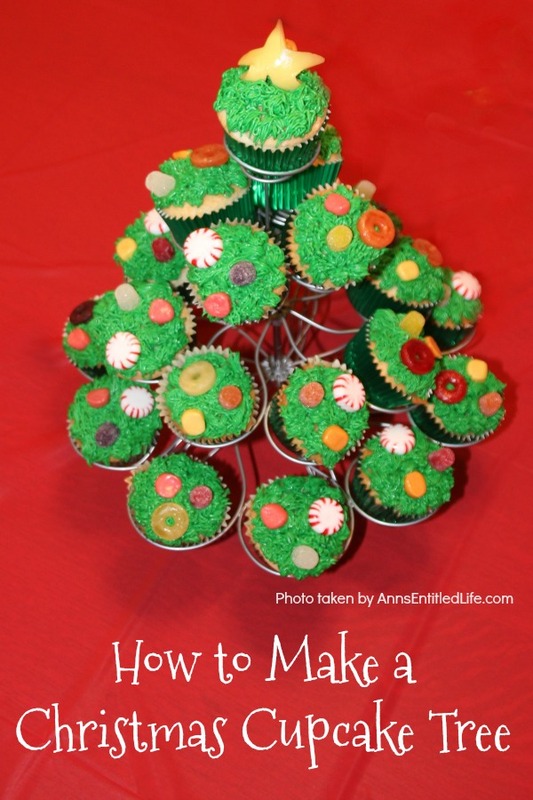 This easy to put together Christmas cupcake tree is fabulous for your holiday party or get-together. 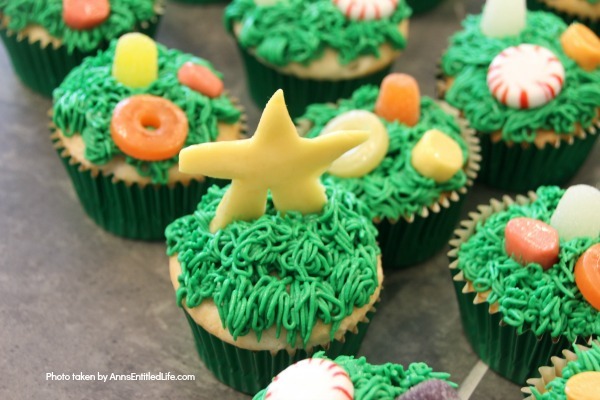 The cupcake stand is simple to dress up, and the cupcakes take hardly any time at all to decorate, yet everyone will think this easy-peasy snack/decor tree took you hours to put together. Nothing could be further from the truth!! • This Christmas cupcake display was actually part of a children’s Christmas table. 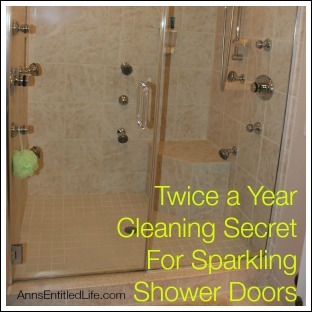 There is nothing fancy about it, it comes together easily, and yet it looks great! 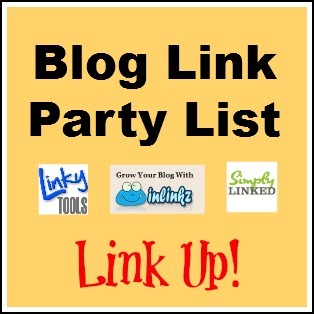 • If you’d like you can add strings of popcorn, dollar store lights or knot together licorice for garland. Note: the star at the top is made out of a Tootsie roll fruit chew. If it is warm in your house, it is going to fall over. The difference in the star shape from cutting it to a few hours later is amazing (it will wilt). Prop it up with the same colored fruit chew behind it (or eliminate the Christmas tree star). • Candy. Lots of different candy! 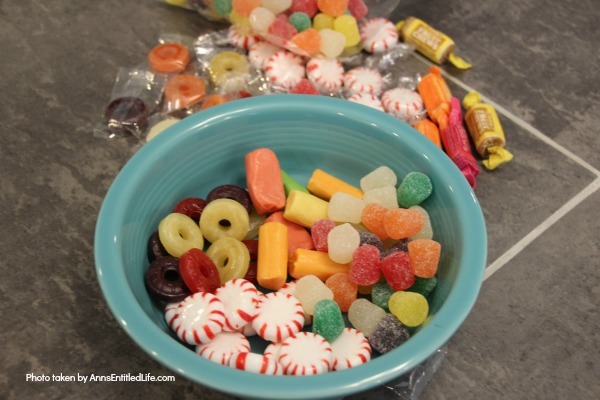 Gumdrops, spearmints, peppermint stars, life savers, fruit chew tootsie rolls, jelly beans for lights… the possibilities are endless! • Meringue powder will stiffen to your frosting. 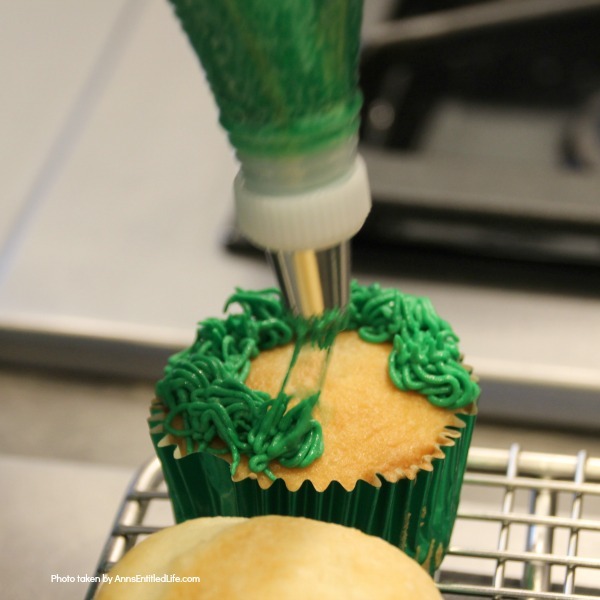 If you are transporting and the frosting is touched, instead of smearing, the frosting will just dent (once dry). 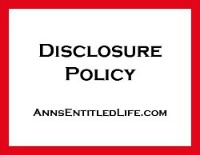 • Insert a Grass Tip 233 into the end of a pastry bag. 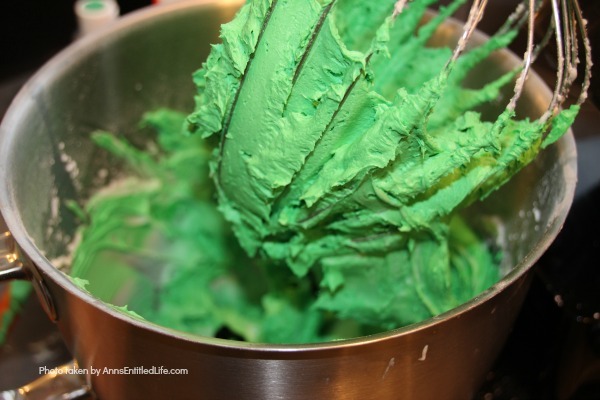 • Load the pastry bag with green frosting. 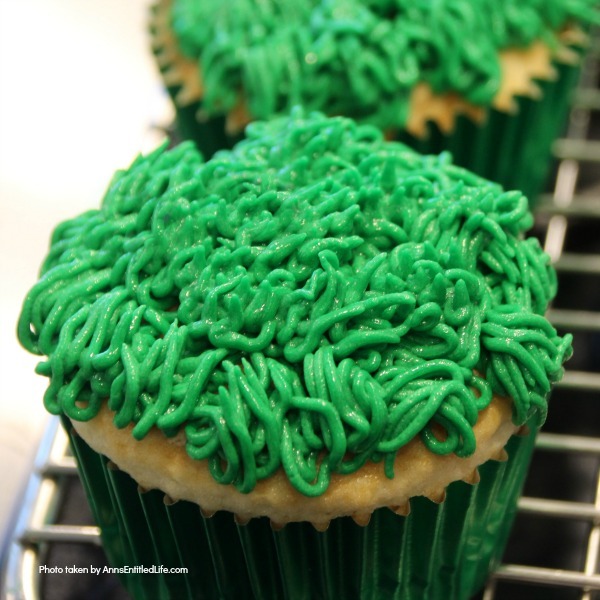 • Frost the cupcakes by stipling (bouncing up and down) for a pine needle look. 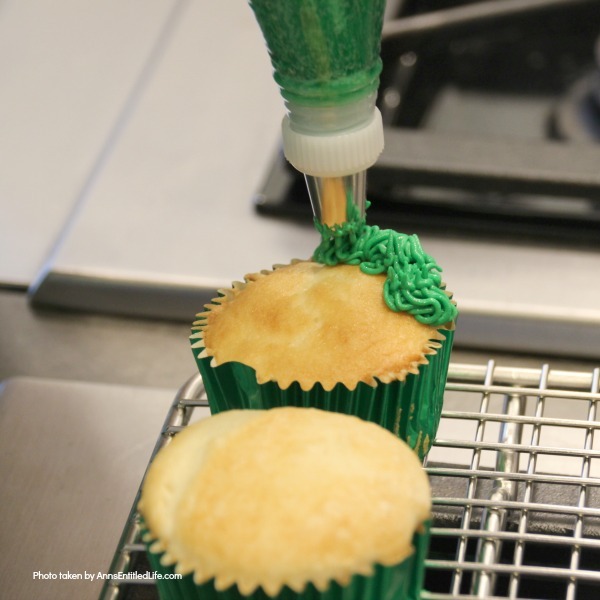 Simply squirt from the pastry bag through the Grass Tip 233 and lift. 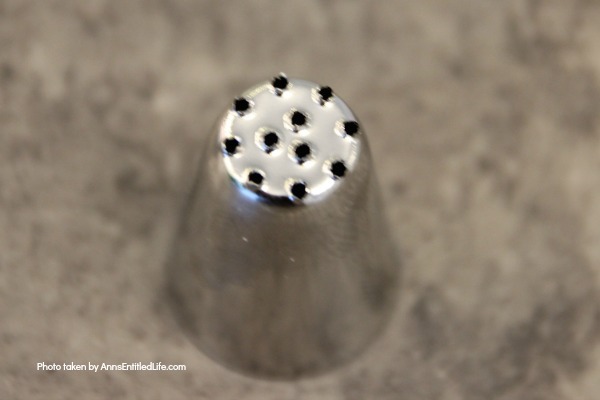 It goes quite quickly, so do not let the tip intimidate you. 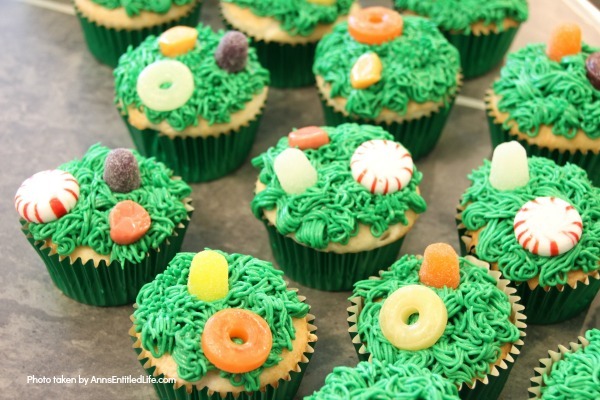 • Decorate tops of cupcakes with candy. Since these are your “ornaments” you can go for a theme, a color scheme, or just place random candies on the cupcakes. 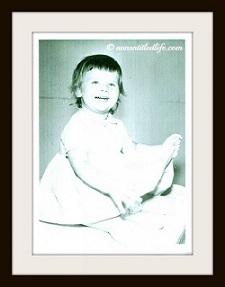 • You can decorate all at once before placing the cupcakes into the tree, or do them one-by-one. If you do them all at once, count the cupcakes per row and stagger the height if that is your plan. You want the taller ones on the bottom, a little less tall next shelf, shorter on the top, and maybe one very tall item at the very top. 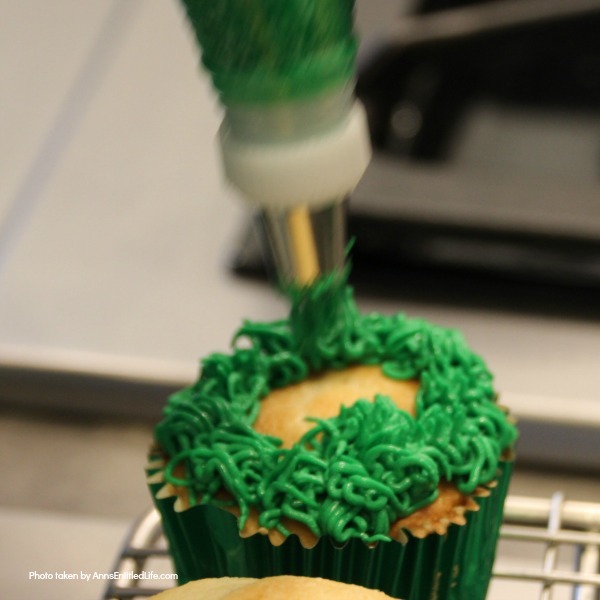 If you decorate a cupcake and place it on the tree, you can easily see what height should come next. You can also have them less “matchy.” These are all one height, but nothing says you have to follow what we did. 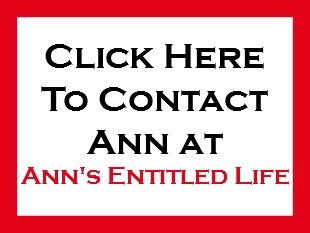 • Flatten one fruit chew tootsie roll and cut out a star shape. 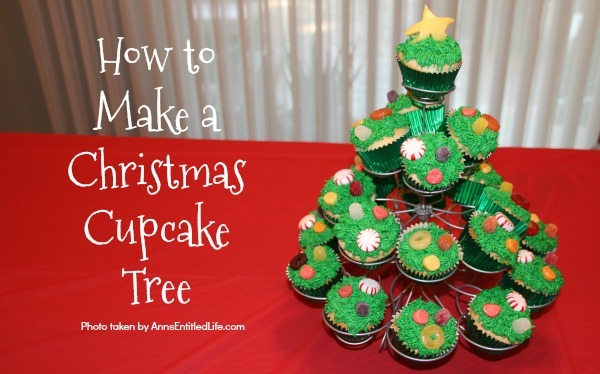 • Place it in one cupcake, and that is the tree topper. 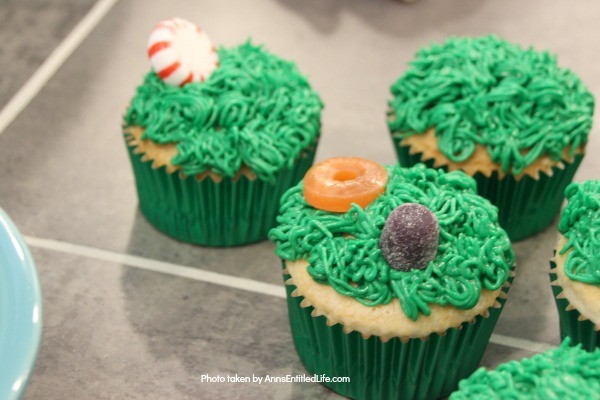 • Place cupcakes in the tree stand. • The tree in this tutorial was done all at once. However, my niece has done this tree many times over the years, so she knew exactly what heights for the candies. If it is your first time making this Christmas Cupcake Tree, and you staggered the heights, I would suggest the one-by-one approach. • And that’s it. It took about 45 minutes to do this fun little Christmas cupcake tree, and that includes the cupcake baking time!! A fast, easy way to dress up a Christmas party table. 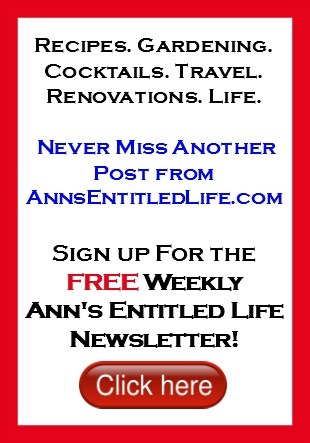 • For more Holiday on Ann’s Entitled Life, click here.